Silhouette Island transports you to a beautiful and mountainous treasure trove of golden beaches, azure waters and verdant jungle interiors. Just a 45 minute boat ride from Mahe, it is the third largest in the Seychelles archipelago. Couples will enjoy seeking out secret coves among the wild and deserted stretches, while families will relish discovering the turtles and giant tortoises that roam along the white sandy shores. Adventurers can select from diving, fishing and snorkelling in the exquisite coral reefs, home to a colourful marine life including rays and turtles. Silhouette Island offers holidaymakers a chance to escape the modern world and enter a tropical paradise of natural beauty and serenity. Year round sunshine gleams over the mountainous interior, smooth granite boulders and the iconic silhouette of Mount Dauban, surrounded by virgin rainforest. Explore the Jurassic Park-like scenery, home to the spectacular black crowned night herons, bats, chameleons and geckos. 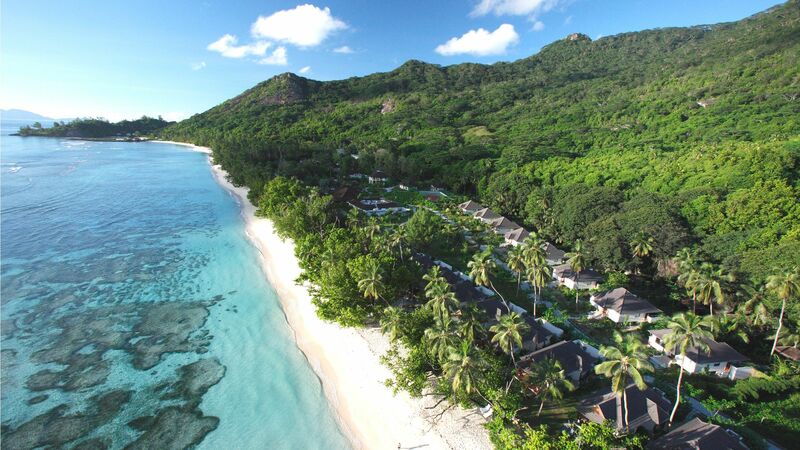 Luxury holidays in Silhouette Island provide you with a slice of Seychelles culture and turbulent history featuring tales of rum swigging pirates and spice plantations. Today, however, it is a haven of fine beaches surrounded by blue lagoons, with Anse La Passe leading the way. Admire the majestic five peaks at the island’s centre, covered in dense tropical jungle, and if you fancy indulging in the luxurious side of this exotic island life, then sample the high end spas featuring rejuvenating therapies and treatments. At Sovereign, we will tailor make a luxury Silhouette Island holiday to match your requirements and offer you deluxe hotel accommodation that has been handpicked and tested by our experts. Your dream holiday will also include selected complimentary airport lounges, allowing your trip to get off to the best start possible. The Hilton Seychelles Labriz Resort & Spa is a superb choice of accommodation and the only resort on this unexplored paradise. World class diving, five star dining and private villas overlooking the turquoise ocean waters await. Walking around Silhouette Island is like peering around a living, breathing natural history museum. Thanks to the twin mountains of Mont Dauban and Mont Pot à Eau, it’s the only island apart from Mahé with a true cloud forest. And with cloud forests come weird and wonderful species like the carnivorous pitcher plant and ancient incense trees. It’s also one of the only spots where Aldabra giant tortoises can plod around freely, plus the canopies come alive with russet-furred Seychelles fruit bats in the evenings. They’re so big they’re nicknamed ‘flying foxes’. A 30-minute drive takes you from the airport to the private ferry dock. From here, it's a 45-minute boat ride to Silhouette Island.